Even in a relatively prosperous city like Bristol, there are certain sites and buildings which lie empty for years and years. Of course a certain level of vacancy is natural and is part of the natural scheme of things, but usually development does then take place within a reasonable period of time. But some sites do seem to get stuck and give rise to concern by local residents, planners and, if protected, by Historic England. Why does this matter? With listed buildings there is legislation designed to ensure that these important sites are maintained and looked after. It does seem amazing that such buildings are not all in use or at least being restored. In all cases there is the issue of a wasted resource – a site or building which could be put to active use. With increased pressure on greenfield sites there is even more need to make maximum use of brownfield resources. In Portland Square (top right), originally laid out over 200 years ago many of the buildings have already been restored or plans are in place for imminent works. The exception lies in the north west corner where there is a gap, caused initially by war-time bombing and then reinforced by decades of neglect culminating in the collapse of part of the remaining façade (Grade I-listed) in a fierce storm about 10 years ago, fortunately without loss of life. 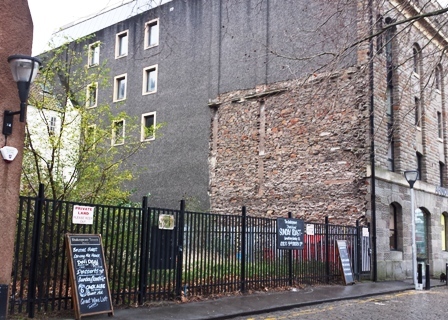 The local community – represented by the Portland & Brunswick Association – is naturally very keen to encourage the sympathetic redevelopment of this site, to bring activity onto the square, and to work with the site owners to achieve a mutually acceptable solution. Update October 2017: Another scheme has come forward to regenerate the whole of this site. See the item under planning issues. 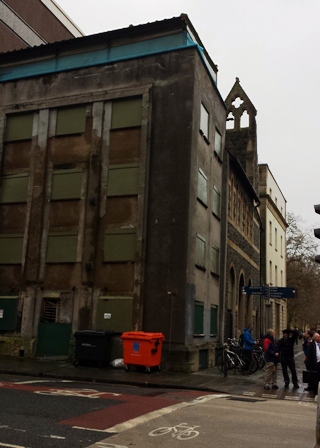 In Stokes Croft, the long-running saga of Westmoreland House and the Carriage Works has attracted widespread comment, community consultation and community outrage. In October 2015, planning permission was granted to a development company called Fifth Capital, following the deferral of a planning decision in April and six months of detailed discussion with the local community group. Use this link for more information.Update October 2017: The PG Group, who have acquired the site have said that they intend to begin to demolish the derelict Westmorland House tower before the end of the year. 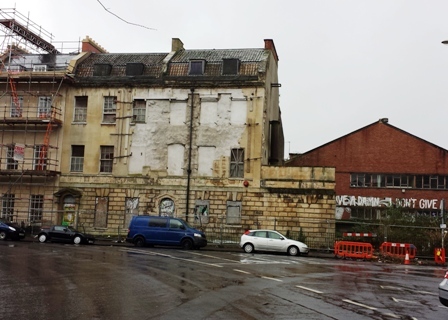 The Society hopes that this will be a new beginning for this 30-year-old blight on Stokes Croft. On Purdown, the World War II anti-aircraft gun sites are Scheduled Ancient Monuments but their condition is gradually deteriorating and there may be a need for much more positive and active management. Elsewhere good progress has been made with the restoration of Holy Trinity Church, Trinity Road by Trinity Community Arts. Grade II*-listed, Bristol City Council has granted a 35-year lease enabling a significant grant from the lottery together with grant aid from English Heritage. At Ashton Court the Lower Lodge (Grade II*-listed) is being restored by the Bristol Buildings Trust and in Clifton Down Road the imposing Mortimer House, a mid-18th century Palladian suburban villa, is nearing the end of a lengthy restoration process. Bristol’s Harbourside has a very central vacant site – in between the Arnolfini and the Architecture Centre – very neatly fenced off and by no stretch of the imagination an eyesore (photo above, left). But surely this site could contribute so much more to the vibrant Harbourside life? And to the owner’s bank account? Ownership issues apparently hinder positive progress here. Nearby the boarded-up church on the corner of Royal Oak Avenue and Prince Street (photo, right) is not listed but surely represents a valuable opportunity for much more positive use? We can raise the profile of neglected buildings, working collaboratively with local community groups wherever possible. We can highlight opportunities, possibly drawing up illustrative proposals to demonstrate potential, much as we did for the possible future of Castle Park in the last edition of Better Bristol. We can challenge wherever there is slow (or lack of) progress. We might contact owners directly and see if there are obstacles hindering progress where an independent organisation such as the Society might have a useful and positive role to play. We can use our Envcironmental Awards scheme to celebrate and publicise completed projects.